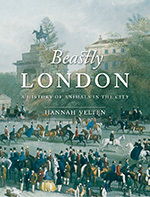 Here are some London history books I’ve read recently. This book was published a few years ago and it’s been on my reading list for some time. Finally cracked it and so glad I did. Diamond Street refers to Hatton Garden and its surrounding area, just north of Holborn Circus, for over a century the centre of London’s diamond trade, along with associated industries. I don’t know why, but I expected this to be a straight timeline historical narrative of London’s diamond trade. While it is that to an extent, it’s a very much a personal account, introducing us as it does to many of the characters of the Hatton Garden trade, many elderly and indeed, since the book’s publication, now passed away. Of these, the author’s own husband, parents and extended family played their part. 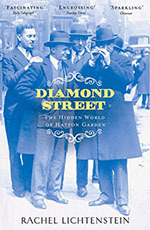 Diamond Street describes a world of Jewish immigrants, often in desperate straits, who arrive in London and set to work in the business, usually from the very bottom as runners, messengers and the like. They become become traders, jewellers, craftsmen, cutters, polishers. They work hard and do business by an unwritten code of honour and honesty. Break the code and you’re finished. Forever. We find out how through their efforts – the setting up of London’s diamond bourse and other institutions – London became the diamond capital of the world. But it’s about the street as much as the precious stones, so Lichtenstein casts her net somewhat wider to include other businesses in the locale – I particularly enjoyed reading about the legendary department store Gamages, closed in the 1960s; and the global leader in metallurgy, the venerable Johnson Matthey, until their smells, fumes and explosions caused them eventually to vacate the area, although they’re still going strong to this day. Like Diamond Street, above, this is not a new book, but I’m about half way through it and I must include it because it’s so good. Hitchcock and Shoemaker are professors at Sussex and Sheffield Universities respectively (honourable mention to University of Hertfordshire, where Hitchcock worked until recently). They collaborate closely on digitising historic records relating to (but not restricted to) criminality and the daily lives of London’s lower orders, resulting in the superb web sites Old Bailey Online and London Lives. 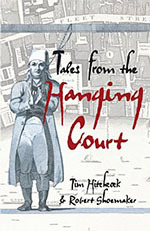 This book features around thirty cases heard at the Old Bailey from the late 17th until the early 20th Centuries. They involve pick-pocketing, fraud, rioting, murder, highway robbery. Notorious cases are included, such as the Gordon Riots, Dr Dodd, the “Macaroni Parson”, the Newgate Monster. 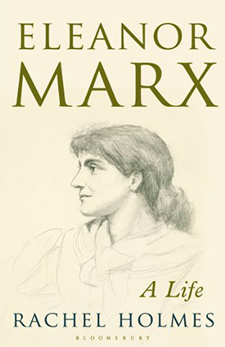 Big personalities of the age – Garrow, the Fieldings – put in appearances. Court dialogue is heavily quoted. The book is alive with drama, fizzing with tension. I must mention the authors’ introduction which sets the scene and puts everything in context: a quite superb 13 page essay which alone is worth the cover price. I anticipate regretting coming to the end of this excellent history book. I love reading the history of things we take for granted. This is exactly that. 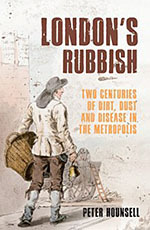 This book examines how we disposed of waste from 1800 to the present. What is interesting it that it is tempting to think of the privitisation of public utitilites as a political hot potato of modern times. Not so for the historian, of course. Here we see that, like with energy, water, health and so on, waste disposal changed hands between public and private constantly over the years. In the late Georgian period when our story starts, the responsibility for public waste disposal was the reponsibility of local vestries who would put the job out to tender. Because most waste was dust and ashes which was used to make bricks during a period of massive expansion in London, the business was so lucrative that contractors paid the vestries, not the other way around. In fact the business was so rewarding that rogue contractors would trespass on the routes of the incumbent providers much to their chagrin. But as supply eventually succeeded demand, this eventually changed to a situation that we’d recognise today. Over the years, waste has changed in quality and quantity and in the method of getting rid of it. Essentially we bury it, we burn it or we crush it. And all of it during the cycle of disposal has to be transported by road and by water. No surprise that so many depots were sited near canals and the Thames. Areas such as Paddington became the rubbish capitals of the capital so to speak. There is a generous section of illustrations in the centre of the book featuring all manner of dust carts, incinerators and destructors. Beautifully researched, an intriguing book. 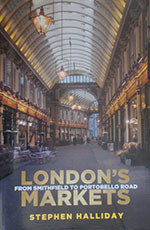 Published this year to mark 1,000 years of a market at Borough in one form or another, this book celebrates the hundreds of markets that have occupied London down the years. 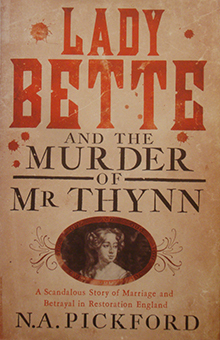 There are the obvious ones of the title, along with Covent Garden, Leadenhall, Billingsgate – cathedrals built by some of our most renown architects and selling the obvious daily requirements: meat, veg, fish, flowers, clothes and miscellaneous tat. Then the intangibles, commodities that make London an international capital of finance: insurance, exchange, currency, stock, bonds. Through the middle ages we very much relied on wool and associated fabrics for our international trade and allowed Italian bankers, the Hanseatic League and their ilk the run of the place in third party trades. That was until Thomas Gresham gave us our own bourse – the Royal Exchange – and Merchant Adventurers, the British East India Company and others rose from nowhere and we were on our way. Insurance, home-grown banks and a plethora of stock companies followed. These churches of high finance are given the full treatment in this book, so the author has been thorough in range and depth without getting too bogged down – all too easy when covering City institutions. We return in the final chapters to street markets. Covent Garden is very well done, along with markets in specific areas: the East End, Camden, and so on. There’s a handy timeline chronology at the end (I love those) and a good index. Overall, this is a nice, pacy history that you’ll knock out in three or four hours and get a good sense of the topic. List price: £12.99 – available for less. Immediately east of the Tower of London and Tower Bridge, we find St Katharine Docks. This can take one by surprise (it did me) since it is successfully obscured by the Tower Hotel. It comprises two docks and a central basin, occupied by a variety of craft, among which we find luxury yachts, Thames barges, Winston Churchill’s funeral barge, and the gorgeous royal barge Gloriana. The dock is girded by the hotel as mentioned, luxury apartments, trendy shops, cafes and restaurants. If you can’t afford to live there, it’s a delightful place to hang out. The dock itself was designed by Thomas Telford and opened in 1829, relatively late in the story of London’s docks. To enable this to happen the ancient church of St Katharine by the Tower, the old hospital buildings and over 10,000 slum dwellings were swept away. The original Hospital of St Katharine by the Tower (after Katharine of Alexandria) was founded in 1148 by the formidable Queen Matilda and in the main has had a female patron and protector (usually the monarch’s wife) down the centuries, even to its current home in Limehouse. It has always managed to stay independent from its close neighbour, the City of London, a fact which definitely informs its character. This book, written by local resident and London Historians member Chris West, tells the extraordinary story of this historic location. It’s in three parts: the story of the medieval hospital and church; Telford’s docks, the Blitz and final closure in 1968; 21C regeneration. There are many heroes and heroines in this story, deftly told. 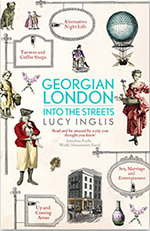 An excellent introduction to a fascinating London district. 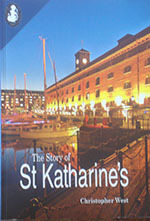 The Story Of St Katharine’s is on sale at various locations around St K Docks, particularly Nauticalia – Chris is pleased to send signed copies if you email him at thestoryofstk@outlook.com or you can order via his website www.charlesdickenslondon.net. 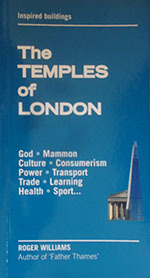 Temples of London by Roger Williams. Subtitled “Inspired buildings”, the author takes us through London’s significant buildings of historic, social, commercial or architectural importance. Divided in to six sections such as Commerce, Industry etc and further diced into three to five chapters featuring about three buildings each, the book must cover around 70 – 100 buildings. Physically, it’s sort of diary format – back pocket size, if you like – and is the type of book one can read in any order, pick and mix style. In the most part, the buildings chosen are not mainstream and touristy although you would know most of them. Williams’s writing is solid, concise and a bit lyrical with humour skimming the surface and frequently a great turn of phrase. In short: great reading. Although you can tell that the author is an admire of all these buildings, he remains even-handed, non-judgemental. So, for example, on the chapter about Harrods, Selfridges and Westfield, he tells us about the Diana and Dodi shrine completely matter of factly. I particularly enjoyed reading about the stations of the Jubilee Line Extension. I have admired these all along, but having read this chapter about the architects and the design of them, I better understand why. The architect Ronald Paoletti is quoted being very sniffy indeed about Pick and Holden of old so the author doesn’t have to; even as an admirer of Holden, that made me smile. Temples of London is a difficult book to pigeon-hole. But that doesn’t matter: it’s a super read and you’ll cut through it. 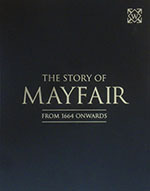 The Story of Mayfair from 1664 Onwards by Peter Wetherall and others. At around 75 pages, this book is an overtly commercial publication, published by Wetherall of Mayfair, an upmarket property company. 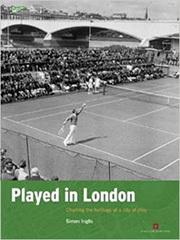 But it is well-written and beautifully produced, giving you the basics of how Mayfair developed. It’s divided into seven chapters, each identified by the author or authors as a “Step Change”, so it goes Step Change 1: 1660s – 1720s. From Mud to Mansions; Step Change 2: 1721 – 1850. Heyday of the Aristocrats. And so on. 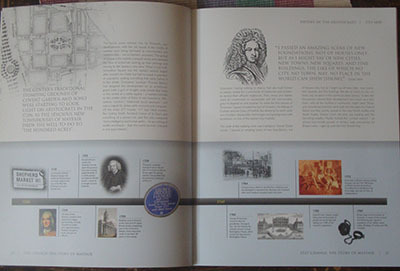 This approach is further galvanised by a timeline ribbon which runs along the bottom of most pages, from 1664 – 1914. Our story progresses over time by explaining the nature of wealthy, from landed aristocracy through new money of trade and finance and all the while the styles of these huge town houses progress in appearance and opulence and fashion. But the strength of the print edition is the illustrations, photographs, engravings etc, beautifully reproduced in a beautifully designed layout on luxury paper, which may explain its price tag.